Almost all of us could recognize a penguin from a picture or sketch. This is true of a 5 year old kid and a 60 year old adult. You might consider this to be similar to recognizing a snake or an elephant but, there is a big difference between recognizing a penguin and recognizing an elephant. The fact is that, many of us will never see a real penguin all through our life! I remember seeing a post box shaped and colored like a penguin when I was a kid. One amazing thing about a penguin is that it always seem to be well groomed, as if dressed in a tuxedo. For most people recognizing a penguin is as far as their knowledge regarding this bird goes. There are some amazing facts about penguins that very few are aware. In this report we stroll through some of these interesting details, this will hopefully increase interest and awareness of this impressive bird. 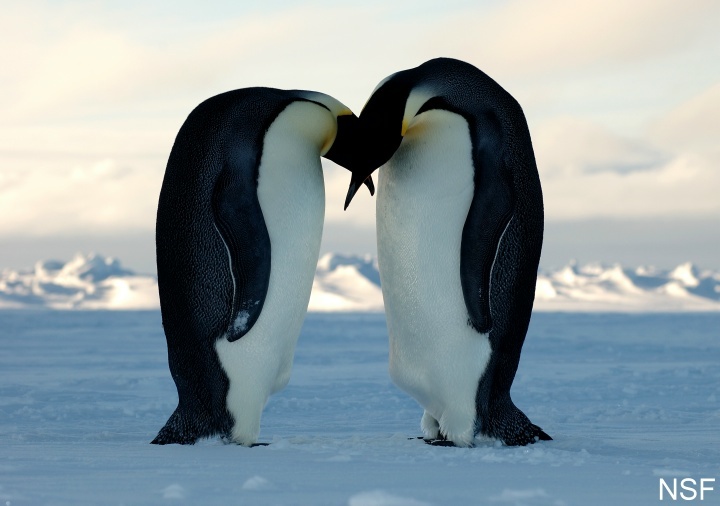 A tremendous image of two penguins, they seem to be kissing each other. In the backdrop is one of the typical habitat in which penguins are found. The penguins are actually standing on a piece of frozen ocean water. Notice the small feet of these large birds, the tail seems to help them keep balance when standing. The body of penguins is covered with layers of feathers. The feathers that cover the penguin are closely 'packed' are of different sizes and shapes. Each type of feather has a different role to play. The outer layers of feathers that cover penguins ensures that water slips off the bird, the inner layers are arranged to prevent the cold waters from reaching the skin of the pendant. 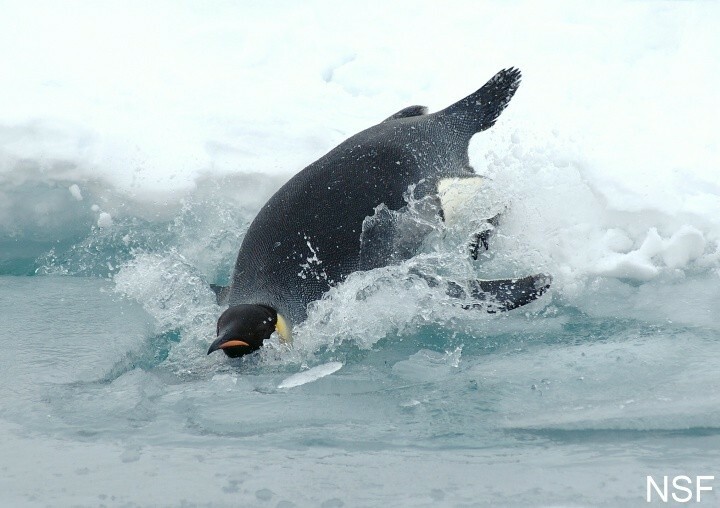 A penguin diving into the cold waters, penguins are good swimmers. It is often heard that penguins can fly, this is not true. A penguin cannot fly, what confuses viewers is probably the leaping of the bird in water. Penguins when swimming occassionally leap out of the water and then dive back. This leaping action could give the impression of the bird flying. The fact is that the penguin leaps out of the water, fills it's lungs with air and then dives back in. There is no known species of penguins that can fly. A very rare image of penguins, these penguins have queued up and await their turn to dive into the water. Notice that they are actually standing on a thick sheet of ice. 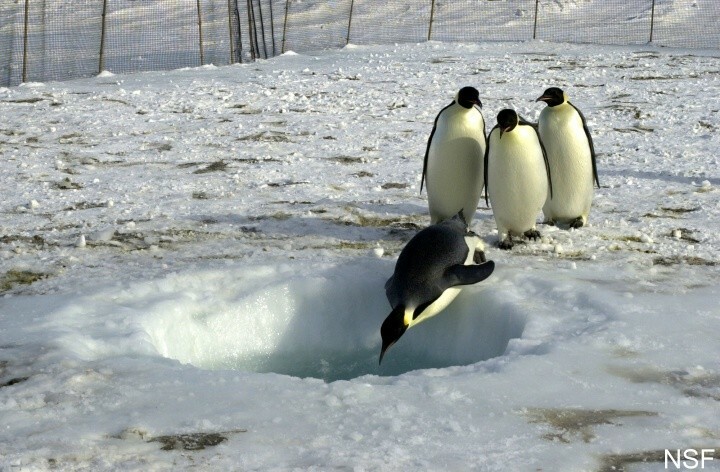 The hole in the ice exposes the water below, the penguin can stay under water for a few minutes but will not dive very deep into the water. Penguins cannot breathe in water, they need to occassionally jump out of the water when swimming. This is done to get their lungs filled with air. In a television quiz a few years back, more than half of the contestants wrongly guessed, that penguins breathe through their 'skin' when in water. The outer portion of the penguin is made up of feathers and not skin, the skin is hidden deep within many layers of feathers. When the penguin gets wet, the feathers prevent the water from touching the skin. 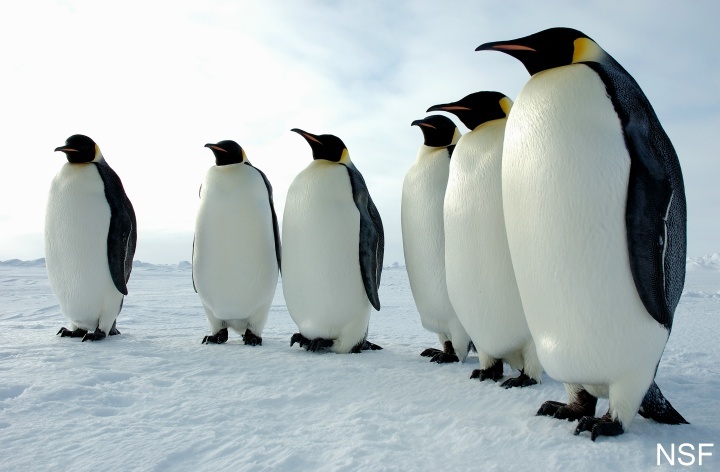 A group of penguins standing in a row, the freezing cold and ice below their feet do not seem to affect them. If you thought that pendants can easily withstand the biting cold conditions that is typical of their habitat, here is something interesting for you. Penguins stay close together inorder to keep themselves warm, you might see hundreds of penguins huddled together at times. Penguins huddle together to keep themselves warm, yes this is a fact. Another thing that they do to reduce the cold around them is to hold their wings tightly against their side. Much like how you would fold your arms tight and go 'grrrrr' when walking in the cold. Like most other animals and birds on our planet, penguins are growing smaller in number too. Fortunately this is one creature that lives rather well in captivity and even breeds normally in those conditions. It is therefore upto scientists to ensure that this amazing bird keeps living on our planet for decades to come. A more complete report on penguins can be read at http://www.leisure.food-recipe-cooking.com/penguin-about-penguins-01.htm you will also find some more penguin images. You are welcome to send your comments and suggestions to easyrambler@rocketmail.com we will be glad to hear from you as this entire site has been published keeping the visitor in mind. The images used in this article have been taken from the NSF (National Science Foundation). The foundation is not associated in any way with the products suggested or recommended on this website. We wish to thank the foundation for allowing us use the images.